Police officers, firefighters, hazmat and the like are all thrilling jobs that prove to be rewarding, but they’re not exactly easy jobs to get into. A majority of these jobs require you to take at least one test to ensure that you’re capable of performing the needs that this job is going to call for. Test Ready Pro offers a variety of courses for a range of career choices to ensure that you’re prepared for the big test in your career pursuit. While we can provide you with the information that you need, studying for the test is going to be something that you choose to do. Our team has compiled a few study tips to ensure that you have a few ideas as to how you can make the most of the information that you learn throughout these courses. Check them out! Setting aside time is always a suggested way to prioritize studying. Though this is the case for all tests, it’s even more important that you set aside time to study because the test that you’re taking is going to affect your career. Even when life gets extremely busy and it feels as though there is little to no time left in the day, you need to stick to the schedule that you’ve set out. Whether you need to set up a schedule at the beginning of every week or at the start of each day, make sure that you’ve factored in anywhere from 30 minutes to two hours of time where you can dedicate yourself entirely to your studies. 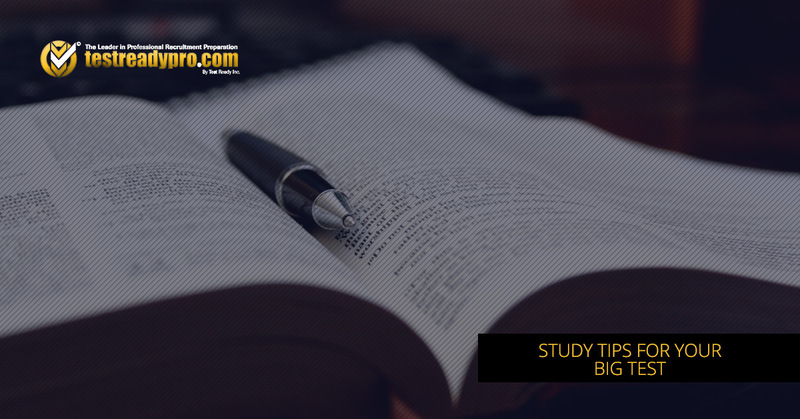 Even the bare minimum of time spent studying will help you progress on your knowledge. Getting your head in the right space to study is a thing, believe it or not! While getting in the right head space is something that you need to do before you start to study, it’s also good to have a physical space that is ideal for studying. Whether you have a desk that you can focus at or you need to build a specific space that’s free of distractions — do it! Try to create a space that will get you away from any technology, is on the quieter side, and has all of the supplies that you need to fully focus on the course material. By creating a study space, you’re ensuring that whatever time you’ve allocated to studying is spent in the best and most efficient way possible. The courses that are offered here at Test Ready Pro are going to cover an array of details so that you’re prepared for any of the exams associated with your career choice. That being said, it can be a lot to take on all at once. As you study the information, we always suggest breaking it up and organizing it into sections that make sense. That way, you have everything that belongs together in one place where it will be easy to find. Aside from being able to have all of the items in one place, you can also use this organizational method to create a study schedule. It’s good to give yourself breaks in between focusing on topics and grouping these areas together can help you ensure that there is always a different topic to cover on different days that you’re studying. We talked briefly about how important it is that you set aside time to prioritize studying, but it’s also important that you prioritize your need for a break. It’s easy to get burnt out from the material that you’re learning and for it to become a mess in your head. If you’re having a hard time focusing, recognize your need to take a break and take one. After a few minutes of fresh air, a meal, or a conversation with a friend, get back to work and focus. In the end, it’s always better to lose a little bit of time studying than forcing yourself to study when you’re not in the right mind. Having a clear head and a thorough focus is necessary to fully soaking in all of the information that you’re learning. These career tests are known for being difficult, and that’s why Test Ready Pro has created courses that are extremely informative. Each course has been created with the help of professionals in that field so that the information is accurate and exactly what you need to ace the test. If you’re planning on pursuing a career as a police officer, a firefighter, or any of the other fields that we offer courses for, make sure to enroll early. Take the course and give yourself the time needed to not only learn the concepts and lessons taught in these courses but to understand them. Browse the selection of firefighter and police prep courses that we offer and enroll in the course associated with your career today!